Respect is the first rule of karate. It cannot be taught, only demonstrated. The mere presence of a Sensei demands respect. When the Sensei shows respect back to the class, an environment of Respect is created. The class will take its cues from the Sensei. Simply put, if students are around respectful adults, they’re more likely to show Respect. Respect is the first part of Dave the Dragon the student will achieve. When the student demonstrates that he has mastered the characteristic of Respect, he will be awarded a part of Dave the Dragon for his workbook. 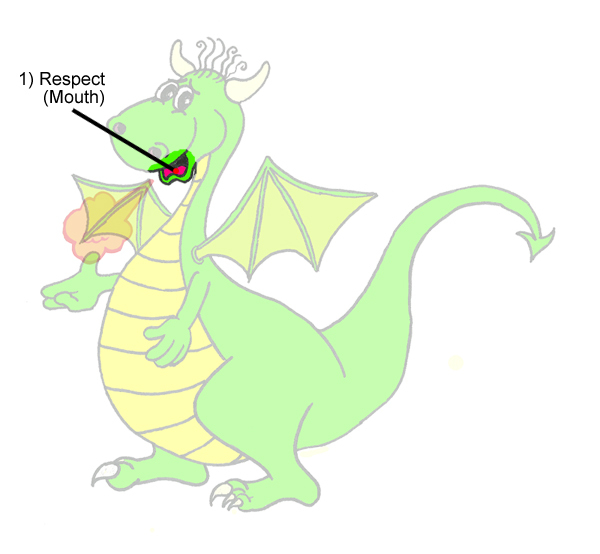 The part of Dave the Dragon representing Respect is the mouth as we can chose what we do and also what we say. Everything we say must be Respectful.